Ray Bianucci, with wife Pauline and their son, Rex, pose for a family photograph at the Beef Steak Inn, which they opened in the 1950s and operated for 22 years. 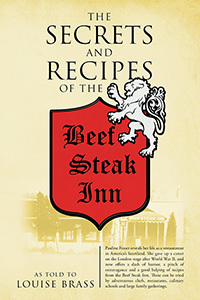 The Secrets and Recipes of the Beef Steak Inn tells the inside story of starting a restaurant from scratch, from Pauline’s humorous point of view, and includes dozens of recipes (some from her homeland of England). She was a tap dancer, revue artist, and spy tracker in London during the Second World War, while dodging the relentless bombing raids by the Luftwaffe. 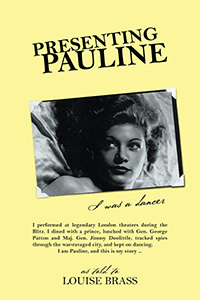 Pauline’s WWII experiences are detailed in her memoir: Presenting Pauline, I was a dancer, as told to Louise Brass. After the war, Ray and Pauline, as husband and wife, began a whole new, challenging adventure—operating a restaurant, the Beef Steak Inn, just outside of Chicago, at the dawn of the Space Age and at the start of a newly invigorated postwar economy. 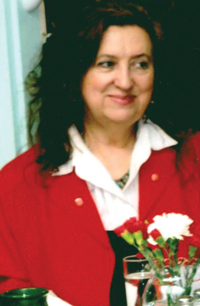 Louise Brass is a prolific, award-winning, writer, biographer and narrator. She is the author of a detective miniseries, the creator and narrator of a children’s audio book, and the former theatre editor and columnist at SCREEN Magazine. Originally from Great Britain, she resides with her family in the USA.